Carlton has defeated Geelong in the Premier Final at the CitiPower Centre, Junction Oval today. The Blues' massive run-chase was the third-best in history after Bill Lawry's Northcote chased down Essendon's 9/514 declared in 1965-66 and St Kilda overhauled Richmond's 427 in 1985-86. It was a pulsating Final and a fitting climax to the Premier Cricket season. Carlton lost two wickets in the first session, with Nick Ross (50) and Harrison Smyth (61) both falling to leggie Brenton McDonald. At 4/162 the Cats had their noses in front, but both skippers have made outstanding centuries in this match and Evan Gulbis kept the scoreboard ticking over with good support from Mackenzie Harvey (30) and then Donovan Pell (29). It was 4/250 at lunch, but Harvey fell, caught at slip by Vines off Reed just after the break. At 5/253 the Blues still required 157 and the game was in the balance again. Gulbis and Harvey added 91 for the fifth wicket. Gulbis and Pell then added 88 for the sixth wicket, and Crone and Gubis put on 42 for the seventh. The Blues finished on 7/412 when Gulbis hit the winning runs. In the final hour there were some plays and misses and several close lbw shouts from the Cats. At the end it was Evan Gulbis, following on from his 130 last week with a brilliant unbeaten 148 today, his 17th Premier century. 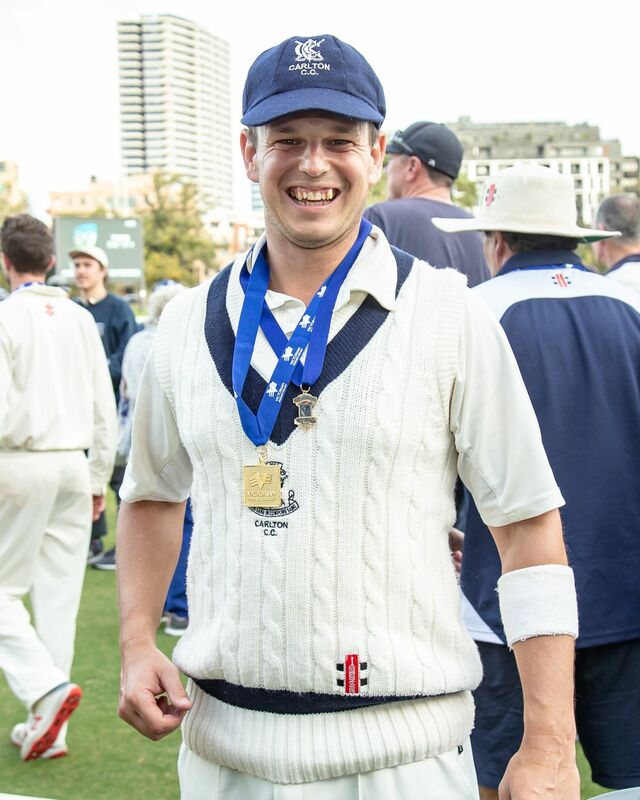 His innings earned him the John Scholes Medal for the Player of the Final. 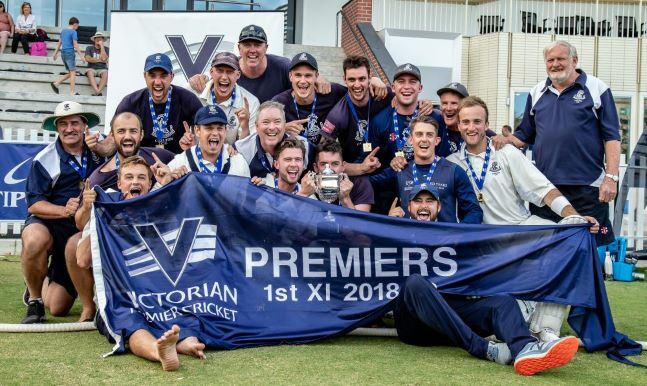 It was Carlton's ninth First XI premiership and its first since 1980-81. It was fitting that Keith Stackpole, a member of the Blues' past three premiership triumphs, was watching on today.